KUALA LUMPUR, Feb 3 — Federal opposition lawmaker Gobind Singh Deo challenged today the country’s top policeman to act against him, saying he won’t stop pressing for answers to the question of motive in the 2006 murder of Altantuya Shaariibuu, which remains wrapped in mystery. The DAP MP for Puchong said Inspector-General of Police Tan Sri Khalid Abu Bakar “has no business” telling the public to stop asking questions as the controversial 2006 murder of the Mongolian model is a matter of public interest. “Many have questioned. Members of the public have questioned. Journalists have questioned. Lawyers have questioned. Lim Kit Siang has questioned. And I have questioned. Is he warning all of us?” Gobind asked in a statement here. “For if he is, let me tell him, don’t play the fool with me. Don’t warn or threaten us,” he added. As a parliamentarian, Gobind said that it is his duty to ask if the police had adequately probed the motive behind Altantuya’s murder. Khalid, as the national police chief, is in turn duty-bound to provide the answers to such a question, the MP said. “So I ask him to state again. Did the police probe motive for the killing of Altantuya Shaariibuu. If no, why not? If yes, do the police know who directed her killing and why? “If the IGP cannot take the pressure of questions any longer, and if he thinks he can get me for asking, for carrying out my duties as MP, l dare him to come. I will take him on,” Gobind said. Inspector-General of Police Khalid Abu Bakar has warned the public against raising the issue of motive in the murder of Altantuya Shaariibuu. “The highest court has made a decision, so there is nothing more to say. “And I am warning those who wish to comment further because there may be contempt (of court),” he told journalists in Putrajaya today. He was asked to respond to Corporal Sirul Azhar’s legal team’s complaint that the Federal Court, which sentenced Sirul to death for Altantuya’s murder, did not look into motive. IS IT A CASE OF MURDER WITHOUT MOTIVE? 1. Mahathir: Who ordered killing of Altantuya? 2. The IGP was reported in Bernama yesterday saying the police had already met up with Sirul, who is currently under immigration detention in Australia, to gather information on all the allegations he had raised. 3. Sirul Azhar Umar: No, the Inspector-General of Police, Khalid Abu Bakar, is olying when he said he sent his men to Australia to meet him (Sirul). Earlier today, Sirul denied that he was interviewed by Malaysian police in Australia over his claim that he was told by a superior to murder Shaariibuu along with another former commando, Chief Inspector Azilah Hadri. KUALA LUMPUR, April 4 — Tan Sri Khalid Abu Bakar today maintained his officers had questioned Sirul Azhar Umar in Australia, after the former police commando said no official met him to check his claim that he killed Mongolian Altantuya Shaariibuu under orders. Referring to a report by news portal Malaysiakini that carried Sirul’s allegation today, the Inspector-General of Police (IGP) said he has no reason to mislead the public and instead challenged the former commando to “spill the beans” if he indeed has new information. “Sirul is a desperate man who is resorting to desperate measures to save his life. He is doing his best not to return to Malaysia where he will be facing the death penalty. “As such, he is doing his utmost to bring into disrepute and cast doubt on the investigation into the murder case, his involvement therein and the criminal justice system,” Khalid said in a statement today. “Let me tell you, there were no officers or police personnel who met me in Australia,” Sirul told Malaysiakini. Yesterday, Khalid reportedly said the police had met the former police commando in Australia where Sirul is being held at an immigration detention centre. The IGP was answering a public query by Tun Dr Mahathir Mohamad, who said authorities must check on Sirul’s claim that he was ordered by his superiors to murder Shaariibuu. Sirul Azhar Umar has accused inspector-general of police Khalid Abu Bakar of lying when the police chief said he sent his men to Australia to meet the fugitive. The IGP was reported in Bernama yesterday saying the police had already met up with Sirul, who is currently under immigration detention in Australia, to gather information on all the allegations he had raised. However, when asked if any police had been sent to meet with Sirul, deputy IGP Noar Rashid said he is in the dark. “Maybe IGP has the knowledge. I do not know, I focus on other things, these things are not within my knowledge,” he said when met at Universiti Technologi Malaysia. Former premier Dr Mahathir Mohamad raised questions about Altantuya Shariibuu’s murder because he was unaware of details on the police investigations into the matter, said inspector-general of police Khalid Abu Bakar. Speaking to reporters at KLIA2 today, Khalid said this includes allegations made by fugitive police commando Sirul Azhar Umar. “Of course (Mahathir) doesn’t know what actions we have taken (and) what investigations we have conducted. “What Sirul recently raised has also been probed by us and we are of the view that there is nothing (in his claim) for us to continue (with) the investigation,” said Khalid. On Thursday, Dr Mahathir “upped the ante” and demanded answers on the murder of Mongolian Altantuya Shaariibuu as well as allegations on 1 Malaysia Development Bhd (1MDB). The former prime minister insisted that police must investigate former commando Sirul Azhar Umar’s claim that he killed the Mongolian under orders, while expressing disappointment over Putrajaya’s attempts to fend off allegations surrounding the heavily indebted state investment firm. 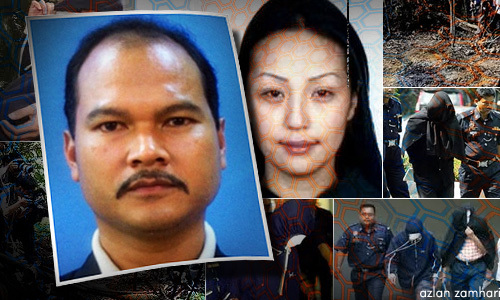 Mahathir: Who ordered killing of Altantuya? People are still wondering who issued the order to murder Mongolian translator Altantuya Shaariibuu, former prime minister Dr Mahathir Mohamad says. Former police commando Sirul Azhar Umar’s claims, Mahathir said, should be investigated to determine the hidden hand behind the gruesome killing. “Apart from (Prime Minister) Najib (Abdul Razak) dismissing the claims as ‘rubbish’, there was no investigation. “This is a human life. It would be very cruel for Sirul to die for just following orders,” Mahathir said in a a blog posting today. XCLUSIVE After fleeing to Australia to escape the hangman’s noose, former police commando Sirul Azhar Umar is now mulling answering the biggest riddle – what happened to Altantuya Shaariibuu? Last month, the Federal Court convicted Sirul and another ex-police commando Azilah Hadri of the 2006 murder and sentenced them to death. In a recent telephone conversation with Malaysiakini, Sirul disclosed that several Australian media have requested for a “tell all” interview with him. “I haven’t decided (on whether) to do the interview,” he said. Meanwhile, Sirul also told Malaysiakini that he did not know the murder victim or Abdul Razak Baginda – the political analyst and close associate of Prime Minister Najib Abdul Razak who was discharged with abetting the murder. “I was under orders. The important people with motive (to murder Altantuya ) are still free,” he said, declining to elaborate further. “It is not like I do not love the police (force) or the country, but I acted under orders,” he reiterated. Politicians are barking up the wrong tree in demanding that police chief Khalid Abu Bakar reveal the motive behind the murder of Altantuya Shaariibuu, said a senior lawyer. Bar Council’s criminal law committee member Baljit Singh Sidhu said the inspector-general of police (IGP) should not be dragged into this matter. “It is attorney-general Abdul Gani Patail who should be explaining as he has custody, control and direction on where the prosecution is heading with the court case. “This is because all the police investigation papers on the case are with the chambers. “As far as I am concerned, the people are barking up the wrong tree. They should be asking the AG and not Khalid,” he told Malaysiakini. Meanwhile, another senior lawyer, who spoke on condition of anonymity, pointed out that it is important to establish motive if the murder is premeditated. The lawyer said that the question in everyone’s lips is why would the two men from the police Special Action Unit abduct Altantuya, kill her and remove all traces of her. “It is more like an assassination than a murder. Is the (police) special force in the business of killing people? What is their criteria in eliminating people? Is it national security or to hide a crime? “These are valid questions which the police must investigate rather than say the court findings are final,” he said. Responding to criticism for saying the motive would never be known, Inspector-General of Police (IGP) Khalid Abu Bakar said murder probes cover all angles, including establishing the reasons behind the action and securing the necessary evidence for a prosecution. “These would then be recorded in the Investigation Papers which are submitted to the Attorney-General’s Chambers for further action. “During the prosecution, the prosecutor would again determine what or which evidences available are to be adduced to prove the case,” he told Malaysiakini. Khalid said the same standard operating procedure would have applied in the investigation into the murder of Altantuya Shaariibuu, which took place under his predecessor Musa Hassan’s watch. He also stressed that it was not the police’s role to question the prosecutor or courts for not delving into the motive during the hearing process. “Nor are we empowered to reveal the motive post-conviction and sentencing when the court chose not to explore that aspect and was satisfied that the evidence had revealed beyond a reasonable doubt that the two had killed her,” he said. Former police commando Sirul Azhar Umar’s conviction has ‘opened a can of worms’ with regard to the murder of Altantuya Shaariibuu, says his lawyer Kamarul Hisham Kamaruddin. While he respects the Federal Court verdict, Kamarul Hisham said, the problem was that the motive was not established. “My client’s conviction has opened a ‘can of worms’ as to what the motive of the murder was. “The motive was not established against my client (whether in the in High Court, Court of Appeal or the Federal Court),” he said when met on the sidelines of another case today. KUALA LUMPUR, Feb 1 — DAP’s Lim Kit Siang wrongly accused police of dereliction for not establishing the motive behind the 2006 murder of Mongolian Altantuya Shaariibuu, Inspector-General of Police Tan Sri Khalid Abu Bakar has said. According to news portal Malaysiakini, Khalid said Lim was criticising the wrong institution for the omission and added that motive is not needed to find someone guilty of murder. “As to why a motive was not established in court, that question is for the judiciary to answer and not the police. “After all, there have been cited murder cases where motive was not necessary for conviction,” he was quoted saying to the news portal. For convictions in murder cases, it is sufficient to show intention to kill or cause the victim’s death. Khalid also said all three court tiers that heard the Altantuya case never found the police to have failed in its responsibilities, insisting that there was no issue of “dereliction of duty” by him. “Never during any of these trials did the court find that there has been a serious omission of responsibilities by the police. “Who would be the best party to rule on dereliction of duty on the part of the police, if not the judges,” he reportedly said. In explaining a typical police probe of murder cases, Khalid said investigations are conducted from all angles, including finding out the motives and sufficient evidence for prosecution, which would then be recorded in investigation papers that are handed over to the Attorney-General’s Chambers. “During the prosecution, the prosecutor would again determine what or which evidences available are to be adduced to prove the case,” he said, saying that this same practice would have been used in the Altantuya murder probe. But Khalid said the police’s scope does not include questioning the prosecutor or courts for not exploring the reasons behind a crime, also saying that the law enforcers could not disclose the motive after conviction if the courts were satisfied with the evidence available. Although the courts did not establish the motive for the murder of Mongolian national Altantuya Shaariibuu nine years ago, Tan Sri Khalid Abu Bakar has a duty to find out why two former police personnel killed her, DAP said today. DAP parliamentary leader Lim Kit Siang said the least a “responsible and conscientious” inspector-general of police should do after the completion of the murder trial would be to launch a thorough inquiry to ascertain why Sirul Azhar Umar (pic, right) and former Chief Inspector Azilah Hadri murdered Altantuya in 2006. “It is a gross dereliction of duty on the part of the IGP that he is not interested in finding out why two members of the elite police force murdered in cold blood a defenceless Mongolian woman, using C4 explosives, when both did not know her and had no logical motive or reasonable cause for committing the murder,” Lim said in a statement. The Gelang Patah MP said that in Sirul’s confession to the police in the form of a caution statement, the elite policeman told the interrogating officer that he was offered RM50,000 to RM100,000 to kill Altantuya. “Is Khalid prepared to have a full inquiry as to how members of the elite police force could be bought to break the law and to commit a cold-blooded murder just for money, and who offered Sirul this money?” asked Lim. Lim also asked whether Khalid agreed with the Mongolian woman’s former lover Abdul Razak Baginda who said that her death was a “straightforward murder” case. Nine years on, political analyst Abdul Razak Baginda still does not know the motive for his lover Altantuya Shaariibuu’s murder but noted that many people have inexplicably died in police custody. Razak was acquitted of abetting in her 2006 murder but‎ two police commandos have been found guilty by the Federal Court after a final round of appeal this month. “Only the two policemen know. Rogue police do kill people, like in so many remand cases,” the political analyst told The Malaysian Insider when asked what, in his opinion, was the motive for the murder. Former lover Razak Baginda says Altantuya’s murder was straightforward although the case is mired in complexities and inconsistencies. Nothing short of a full public inquiry into the Altantuya murder and the motive for her murder will do. The prosecution of the case has been tardy from the start, with the failure to establish the motive for Altantuya’s murder the most questionable of all. Through the case, the labored attempts by both prosecution and defence to obstruct the probe into any involvement of the then defence minister were also most bewildering. 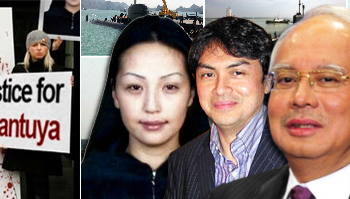 In the recent interview, Razak Baginda claims that the murder of Altantuya had absolutely nothing to do with the purchase of the Scorpene submarines. First and foremost, this judicial inquiry in France into whether or not commissions were proffered in the sale of the Scorpene submarines has been initiated by the French judiciary. The French prosecutors have been busy for more than four years now trying to get to the bottom of this scandal. The facts that have emerged recently about the scandal are the result of the investigations by the French police, not unfounded allegations by Malaysian opposition parties or NGOs. This entry was posted in altantuya, crime, crime in high places in malaysia, france, IGP, Lim Kit Siang, malaysia, Malaysian PM, nazib razak, scorpene and tagged altantuya, crime, death sentence for killers of altantuya, IGP, limkitsiang, malaysia, Razak baginga, Scorpene, Sirul. Bookmark the permalink.